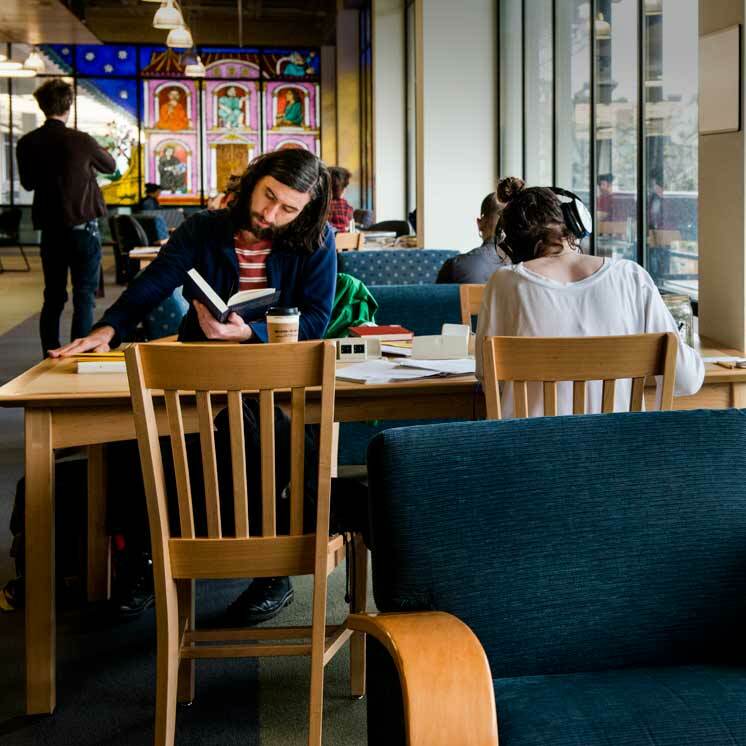 Work with a group or on your own in one of our many study spaces. Students use one of the study rooms available in the Library on every floor. The designated quiet area can be found on the third floor. Look for the blue Quiet Study banner. Computers are available for public, student, faculty, and staff use on the second and third floors of the Library. We also have Chromebooks available for checkout for a week, with no renewals. Visit the circulation desk for availability. A student finds a spot to study in the library. More than a dozen study rooms are available with tables, chairs, and whiteboards. About half are first-come, first-served while the others can be reserved ahead of time by students, staff and faculty. Four media viewing rooms include DVD, VHS, and flat-screen monitors. They're comfortable for up to six people. One larger room accommodates 10 people and has a computer and larger monitor. This room is reservation-only. Visit Schedule Evergreen to reserve a study room. At the time of your reservation, see the Circulation Desk to check out the key. Our three large classrooms hold up to 40 people each. You can reserve a classroom through Schedule Evergreen. Students, staff, and faculty gather to celebrate the release of the first publication by the Evergreen Press. Student writers read excerpts from their contribution to the book Writing American Cultures. You can reserve one of a few lockers for up to a year through the circulation desk. These services are located inside the Library, but are managed independently. Contact them directly if you have questions or need assistance.